This week a customer in Asia asked why one of our new epoxy fluxes was not allowing the package-on-package (PoP) device to be picked up from the dipping tray. Obviously, the vacuum nozzle must have sufficient force to extract the PoP package from the PoP flux reservoir (yellow, below). where A is the measure (fraction) of atmospheric pressure and denotes how good the vacuum is (zero vacuum is 0.0atm : hard vacuum is 1.0atm). There are some uncertainties with this approach: How does the vacuum vary across the nozzle diameter? 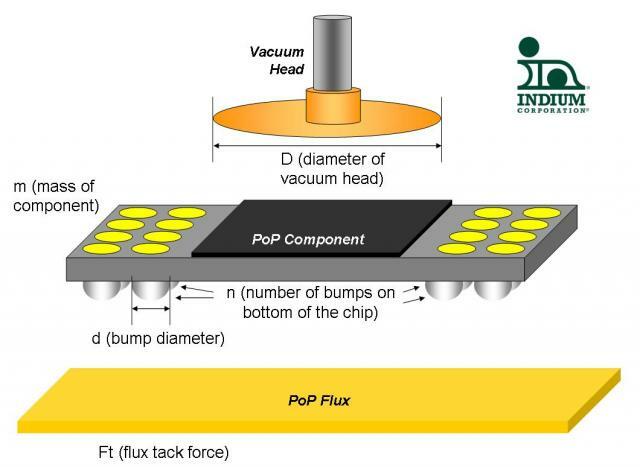 Does the 5mm diameter probe used in the IPC test equate to a complex CSP (chip-scale package) bottom surface, with many rounded solder bumps or solderspheres? And so on. But, at least the model puts us in the right ballpark. Just to give you a feel for how this works, the second figure shows some results. Note that scenario (iv) is the only one showing problems (negative force balance). For many of the newer applications, component sphere/bump immersion to just deeper than the bump height (say 100-110%) is desirable. If the customer dips the whole bottom of the component into a standard (non-epoxy) flux, this potentially opens up a lot of issues including reliability (SIR; electrochemical migration); component displacement (skewing) during reflow; as well as difficulty in picking up the component from the tray. The solution to this series of issues, is to choose either a standard flux with a high pre-reflow SIR, such as our PoPflux 30B, or a low-volatile content epoxy flux. I'll have more to say on epoxy fluxes in a couple of months, as we are currently nearing the end of extensive testing at several customers in Europe and Asia.